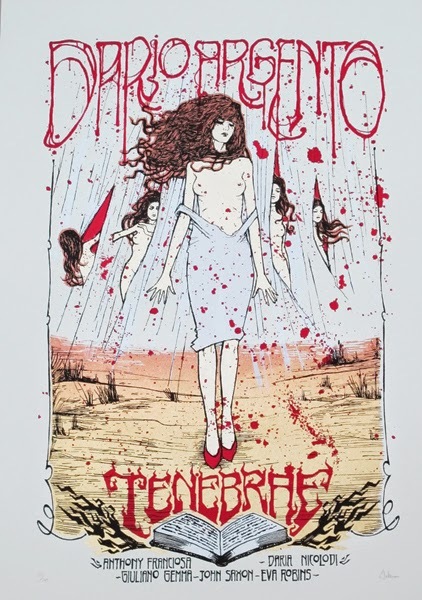 I think that, technically speaking, Tenebre might be the best film I've seen from Dario Argento so far. It's certainly his most self-aware and self-reflexive. The protagonist is a clear stand-in for Argento, a famous writer of what appear to be giallo novels in the same vein as Argento's giallo films. Peter Neal (Anthony Franciosa) is also criticized for his purportedly sexist subject matter: "Tenebre is a sexist novel! Why do you hate women so much?" But that's not where the connections end. The murderer, who keeps killing fans of Neal's work, has a penchant for photographing his victims. In the duality between writer and photographer, here we have the two most common aspects of a director's work brought to life. Each half of the whole embodies different aspects of Argento's idea of himself and of directors in general. And insofar as the author and the killer are doubled representations of the director, Argento is here literally killing his own fans. From a technical standpoint, Tenebre is also Argento's most impressive work. His collaboration with cinematographer Luciano Tovoli (the pair also worked together on Suspiria, which I still can't shut up about) is nothing short of masterful. There's an incredibly long crane shot (NSFW) which feels like a combination of Touch of Evil and Enter the Void. It showcases not only the choreography of the actors within the house but also the directors use of suspense as it brings the set to life and forces us to wonder what's going on in the parts of the house we can't see. There are also smaller touches, like the continuing use of demonizing POV shots and the ever-evolving methods of hiding the killer's identity until the denouement. There's also this great moment where the protagonist runs away from the killer and the camera initially follows him but ends up slowly panning back towards the killer, as if magnetically drawn toward him. I could talk about this stuff all day. The film still showcases Argento's strange predilection for distractingly obvious dubbing and slightly simplistic dialogue, which I can't quite wrap my head around. But the central theme song inspired Justice's "Phantom", so it's really hard to find anything wrong with the film when the insanely perfect score kicks in. It doesn't quite rise to the level of Suspiria in terms of my personal interest in it, but Tenebre might just be a more impressive film in its technical construction (writing, shooting, etc.) despite not playing specifically to my tastes the way Suspiria does. Despite watching four Argento films in under two weeks I still haven't managed to tire of his work. Looks like all I need to do to maintain my ideal image of him is to stay away from his newer films.